Even few hours in darkness or without electricity can be difficult for us. Villages in rural india do not have enough light to study or even to make food. Every individual thinks India needs to change!Every individual knows that the change will help growth! We all spend great time of the year , in doing no productive things to give back to society. We can atleast spend 10mins out of whole 365 days just to support a cause #powerlightavillage and light atleast one house in rural India. Join my hand , and you join their hand and lets form chain to spread the message to light a village this year. Contribute by spreading awareness through video link and asking your friends, family and supporters to support a social cause. This great initiative is by @Thegarnierman and they need our support from Urban India to support RuralIndia. So I had chance to explore biking culture in Qatar after riding for India for while. Campus Magazine have taken on interview over the group that I belong that is The Bikerni Association in India and Soul Riders in Qatar. Here is the small Interview session on the same. Read about the same and share with friends! We all spend our Christmas by giving gifts to friends, families and loved ones. Christmas, means time for celebration, time to spread the joy and smile to the world and this is what our very dear “Santa Claus” did to our kids. So here the “Santa Claus” was “Madoverdonuts” where they gave donuts to give away as gifts for the kids… We are young enthusiasts who creates memories by sharing pictures (No age bar) planned to celebrate Christmas by giving small happiness through these donuts. Madoverdonuts along with Photokatha created memories for the Gods kids. So they went to a small village in Sanpada…where there were about 25 kids for whom the donuts were a new food item. They looked at the donuts with hungry eyes and enjoyed the most while having it.. Each kid had a twinkle in the eye for the Christmas celebration and some of them even asked in their local language “are you the Santa Claus?” Hearing this , we felt that this the best way to share donuts and happiness for Pre Christmas celebrations..
Madoverdonuts NaviMumbai along with Photokatha created memories for the Gods kids. So who are you planning to celebrate Christmas with? After a good sleep and some updates on live tweets, early morning travel to Pushkar was something I was looking forward to. Hotel manager- Dibendu helped me in booking a direct bus which starts at 9.am from close by bus stop by Jai Ram travel directly to Pushkar. A ticket of INR 170 takes you fromJaipur to Pushkar in 4 hours and good mini bus. I was surrounded only by foreign tourists which was a tour arranged by the group by G Adventures. So they travelled for 15 days in India to places like Delhi, Agra, Jaipur, Goa..etc told by their tour leader Mr. Zahid Bari. Mostly Handling vibrant tours of India, they have mix of elite, budget tours ,etc . Met David from Australia and many others from the tour and asked their till now experiences of India. The only words I could remember is “ Beautiful, Vibrant, Warm people, Great Culture” ..and these words always make me proud.. The journey through small villages on the way to Pushkar..Landscape of hills…every 10 mins a temple made the journey serene from the mundane work…. Reached the Pushkar main stop , around 1pm.. and there was already plan of @photokatha meetup with @snagpal @shaylnee, @aks_hai and @ldnbcn.. at Out of the blue restaurant. To reach this restaurant, cyclists taking people in small box like sitting (In hindi it is called haath gadi ) was the only way to reach the restaurant as it was far by 20 mins .,which was in the main market. . The first glimpses from Pushkar, was only about colors, priests of different styles and colors, food sold in random things, foreign tourist more than locals. Out of the blue restaurant had great eye view of Pushkar ghats, and striking ambience of blue.You had to climb 2 floors to be in the restaurant where you had floor seating style with comfortable tables and lounge beds. And you get great overview of Pushkar. With such a heavy travel, this was THE place for lunch I was contemplating. So we did mix of orders like Italian with Gnocchi pastas , Indian dishes like Paneer and malai kofta. Hummus is something you shouldnt miss at this place. unique about this place was that guests didn’t give feedbacks here on paper. The entire wall was covered with feedbacks from guests After the stodgy lunch, now was the time to settle the luggage before I get drained even with that small luggage. Please note being solo traveller, meeting new people from twitter with the help of @photokatha did raise eyebrows to some of the people. However this meetup was really helpful, as shared cross-country experiences, photography, travel, India Culture,etc. Shaylene ( Met through twitter) had already booked a room in Amika Guest house..where she was paying INR 500 per day only.. For an extra person it was only INR 200 which was good deal for both of us. The guest house was right opposite Varaha Ghat which was supposed to be the ghat for Maha Arti as well. So feeling comfortable the amount of distance to be walked is cut down and major evenings would be shot by Ghat side. Pushkar being city with small lanes, and less transport during such festivals, backpackers should always carry handy bags and fewer luggage. So from restaurant, I walked about 15mins till my guest house was seen. Passing by colourful shops selling rajasthani bits and pieces.The guest house had very old era appearance with wooden doors and chains locks. As you enter ,you get this atrium surrounded by wooden stairs and rooms, where during those times one could shout out for water downstairs(during those dates water was never available in the room.It gave me a feeling of my hometown in kolhapur. Reaching room, which was very small, with pista colour , I decided this would be the place just for sleeping. Now you cannot expect in Rs.200 , you get the best of facility. Whenever the word solo “Women” comes, the first question arises to the human mind, “Is it safe” to travel in new city? How about staying alone in hotel? Arent you watching Crime patrol(A series on real life incident towards crime on national tv)? These all questions definitely came to my inquisitive thoughts, but I always knew from my heart if you travel safely and cautiously then even a woman can travel none other than a man. So here I decided to visit world’s only Camel Trading Festival called “Pushkar Mela”. 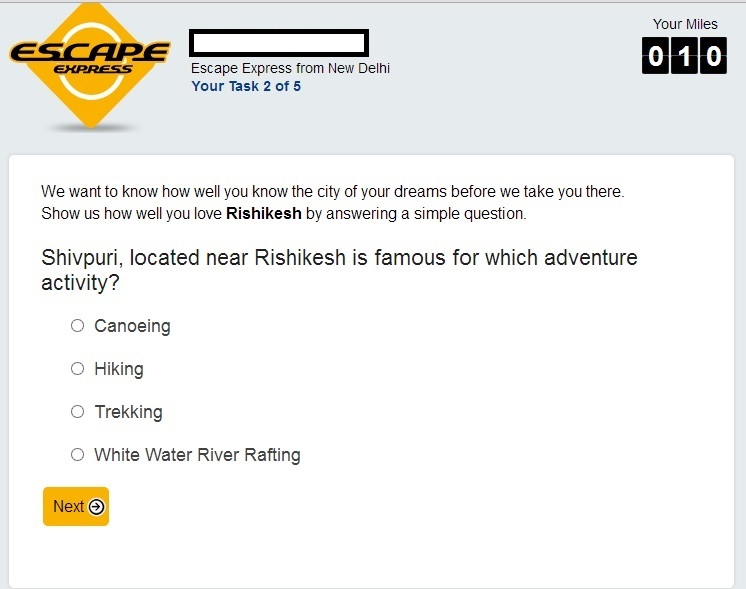 Or you can also call the “City of temples. 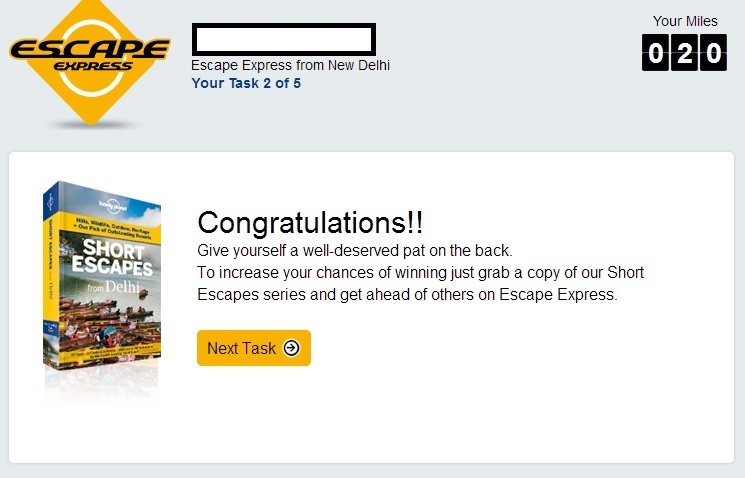 So the month I decided to book my tickets, I was penniless. A gentleman (that’s the contradictory of him) Rohit Uphadhyay booked my tickets through goibibo in the month of October only to avoid these airlines making money later from poor middle class youth. So he guaranteed me that even if you arent ready to leave for airport they will remind you to go as thier messages are very active. and trust me that really helped .Now thinking it would be working day before being transferred to new job, he booked and evening flight to Jaipur which would land 10pm in night. That’s where my apprehension got more over my mind, as solo travelling for the first time and reaching the city late . 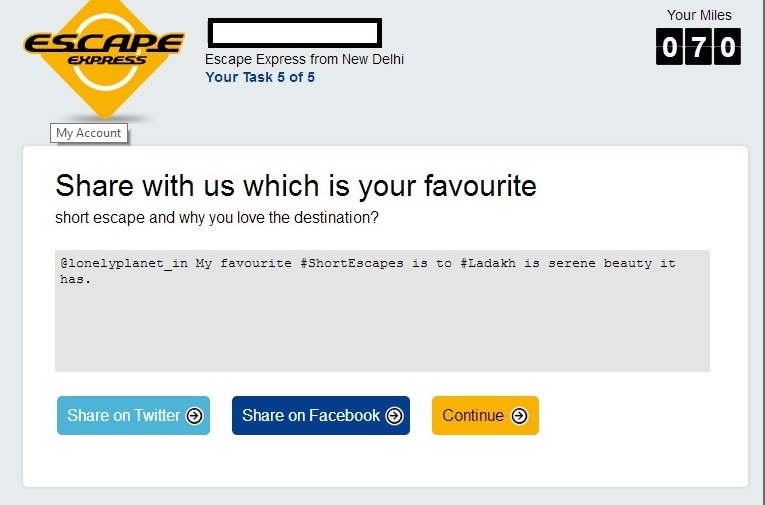 Trip advisor and makemytrip played a massive role in giving me the option to book a hotel with amazing real time experiences by the guests and travellers in Jaipur. Being solo traveller late night stay would be more feasible then to travel in night for another 2 hours to Ajmer. My flight was for 22nd November, around 8pm from domestic airport and I decided this time to travel from Navi Mumbai to Vileparle in train. Direct train from Vashi to Andheri at 5pm was the safest play to reach on time or rather 45 mins before the check-in. Always heard the concept of travelling light from people who have been in biker fraternity and solo travellers. So this is the first time in my all journeys, I was traveling only with one baggage ! Eureka I achieved the Tagline “ Travel light always”. Whenever, I have moved from Navi Mumbai to Mumbai for any purpose I always wonder, what would be the future of this Mumbai with no trees. In Navi Mumbai after every distance of seconds I see one tree. And in Mumbai at every distance of seconds I only see building and restaurants. So appeal to people reading blog, try reducing papers as much as you can and use maximum your computer or mobiles to read newspaper, articles. DO NOT print office documents if not required, rather use hard drives to store them . Gosh, taken by the Mother Nature emotion. Coming back to my travel, to reach airport, I got down at Vileparle station. Now this information was clearly derived from my tweeple. Some sweet people like @ajindam, @ssethia007, @pushpz, @rinashah @talkortweets , @rushabh69 and rajat bigghe. But most of them forgot to mention if it was east or west. However, I forgot to ask as well till I reach station and realized that I got down at the wrong side and again will have to ask rick guy to take to Vileparle East which is closer to airport. Boarding happen within 20mins and the flight took off on time Indigo Airlines as always, so I was at ease that hotel driver will not have to wait. All short journey in flights are boring as you cant even sleep and cant even work on anything. Aparently while walking on the pathway to find my seat and being busy in live tweets , I suddenly heard my name being called “ Rutavi “,and I look ahead, It was Priyanka Singh- my colleague from my previous organization who now had become Air hostess. So now on in flight menu is free for me .. lol . She offered me some great juices, dinner and tea&coffee. (Suddenly my co-passengers were interested to know if I was an Air Hostess, how I wish ). My neighbours were a sweet old couple who still kept themselves active by criticizing each other’s action. He (Mr. Sharma ) mentioned that bcz of Ms. Sharma Im gonna become bankrupt soon as she just shops where I take her..(Nothing new Uncle, all aunties have similar actions). The flight took off at .8.30pm and landed Jaipur at 10.pm. As soon as I land, I receive a call from the driver that he is waiting outside. A sigh of relief that he has reached on time in a new city made me love the city more. Hospitality being in my blood, will never let me go and that’s what made me land in this situation which was just coming. Seeing the tourist attraction for these dates, I had verbally booked with Hotel Kalyan on the reference of Hotel Pearl Palace owner Mr . Satpal Singh, as during that time Pearl Palace had no availability of rooms. Now after landing , driver informed that Pearl Palace had room for me. So was excited as would get to stay in the much awaited beautiful hotel for budget travellers called “Hotel Pearl Palace”. But on the same front Hotel Kalyan room which was booked and now seen and was defnately not upto mark. So the driver Saleem , mentioned “No matter where you booked you should like the hotel”. This made me finalize my decision that I would like to stay with Pear Palace only. The hotel staffs were very courteous and warm as entered. Being a budget traveller hotel, it never seemed to me. Ambiance was designed with lots of artifacts like elephants, sculptures, etc. Skilfully done carvings on the wall of the pathway along with ceiling painted in the unique Jaipur style fine work. At a very reasonable rate of INR 650 per room, the decor of the room was very stunning (wish could research more for word on dictionary for being more expressive) . Towels were used to make these artistic Swans …walls had these paintings of Jaipur kings and queens. It gave complete feeling of staying in Jaipur to a new traveller in city. I would definitely recommend this hotel on all portals for budget travellers to use this hotel during their visit in Jaipur. Also there is amazing roof top restaurant catering cuisine from different places and ambiance was of backyard garden with artifacts. Again seeing the place you might feel its expensive, but Puri bhaji for me during breakfast costed only INR 60. “My name is Khan and Iam not a terrorist” Dun worry I am not writing a film review, but giving you a very different experience to food and restaurant which I recently visited in Hyderabad- State of Nawabs as always addressed . 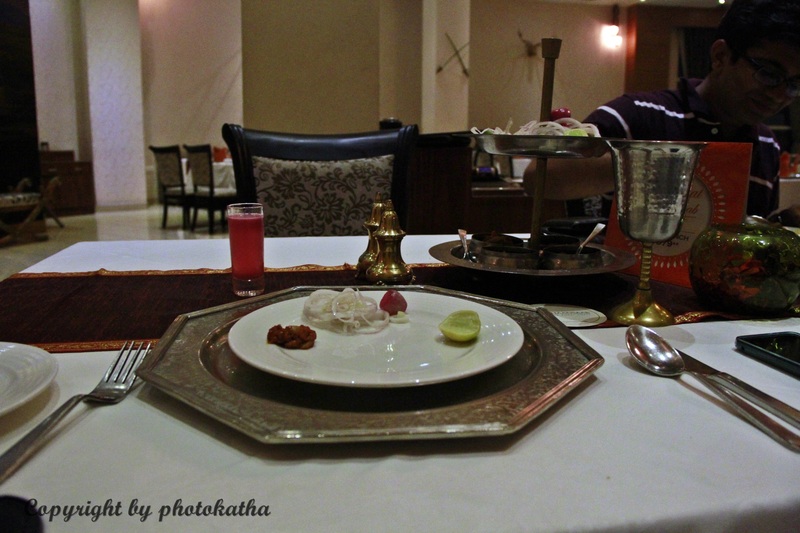 The sumptuousness of Hyderabad cuisine is every rich and colossal. Something similar was when I visited Khan Saab restaurant with burrp City manager Rajat Bhigge (Hyderabad) to experience the Nawab style cuisine. 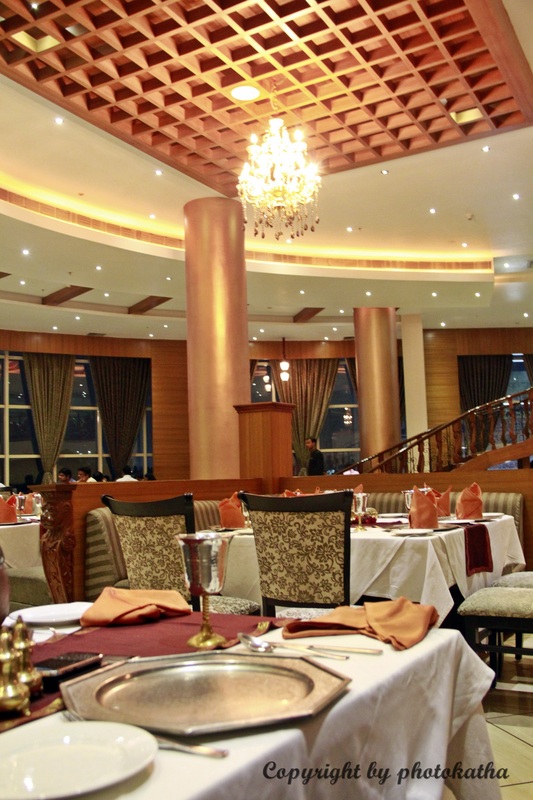 This restaurant serves Indian, Mughlai, North Indian, Grill , Kebabs ,Peshawari , Hyderabadiand and North West Frontier. As you start finding this restaurant, in the mall called GVK where as you enter the mall, you will see these huge aquarium with great array of fishes like clown , sharks, and some unkown fishes with polka dots, and some with stripes (sorry not into fishology), you will hear the doorman of Khaan Saab asking you “Aap Khaan Saab Dundh Rahe ho” just near the lift. The restaurant entrance has these enormous stairs like in our Hindi Movies ..when the heroine is asked to run from the first stair till last ..and phewww…three episodes are over in it.. It also gives a feeling of you being on Titanic ship, as you are coming down the stair and Leonardo is waiting down. Actually the reality hits when the staff comes and wishes you “good evening” in typical telugu tone. The stair leads you to the sitting area and there you will see glimpses of silverware on the table from far. 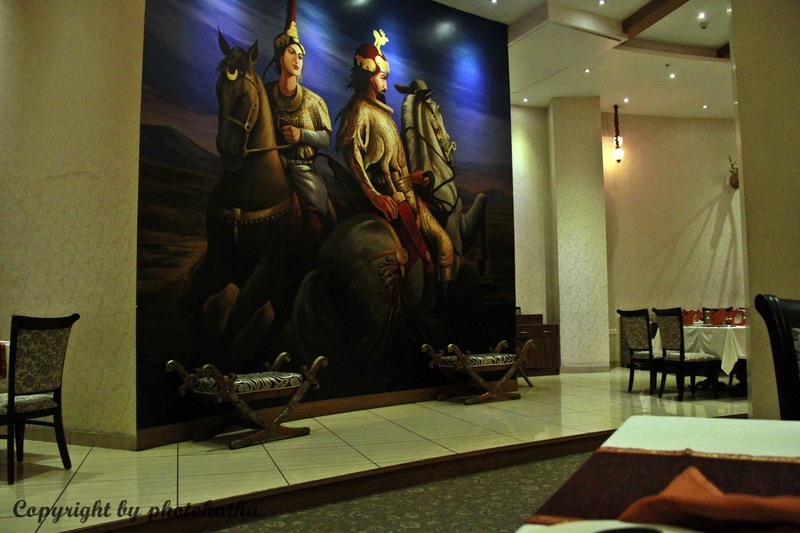 Taking your eyes around the restaurant, you will come across huge painting of kings, swords, beautiful chandeliers,etc. 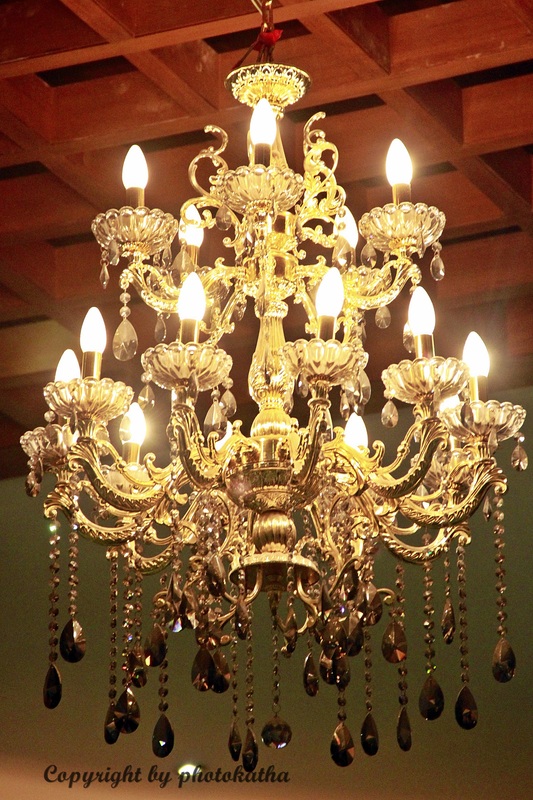 This one particular Chandelier took away my attention for more than atleast 10 mins. Seeing the flashes and glimpses of restaurant you will think, it would be highly expensive for a couple to dine here. With such opulent and captivating ambiance, the prices had to be a notch higher.But ideally,for a couple it would be between INR 1000 without alcohol. 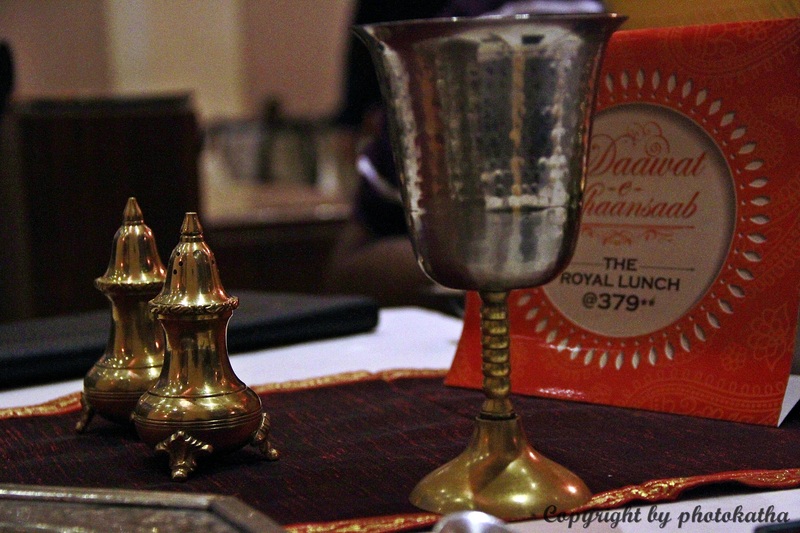 Being seated on the chairs, eyes fell on the silverware used for the setup, which gave us the feeling of nawab already. Was just waiting if I get to see some dances as well (too much expectation from me). Todays menu was appetizers including fish kabab and chicken tikka,. They were succulent, irresistible and mouth-watering. Being a vegetarian I couldnt comment on this , but I could guess it from Rajat when he mentioned about his experience while eating. Then it was the time for main course where items were again evenly spread and had a distinct flavor. Dal makhni was very flavorful and sumptuous , that I didnt leave even a drop of it in the bowl served. Chicken Lawabdar and rotis to go with..was the combination for any non vegetarians. Not to forget the Biryani and Chicken Peshawari were really good (heard from online reviews). We dined with complete satisfaction knowing that it was a value-for-money experience. The portion size for each course is little much more than two. So we had to parcel some of the food for midnight party as well. No food or cuisine is complete without dessert or Paan to go with it. Had a magai Pann priced INR 30 which completed any space left in my stomach as well. So since timing was an issue we closed with the billing and headed towards exit . Do you love elephants? Have you ever tried to go close? Arre Iam not watching National Geographic, but Im talking about Khaan Saab only. 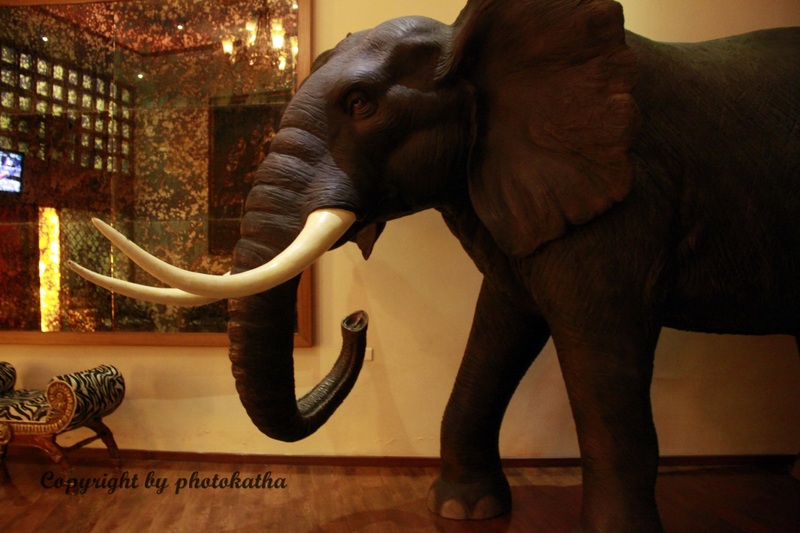 There is gigantic model of African Elephant, where you can click your next facebook and twitter between the Tusks. This came as a great surprise to me. 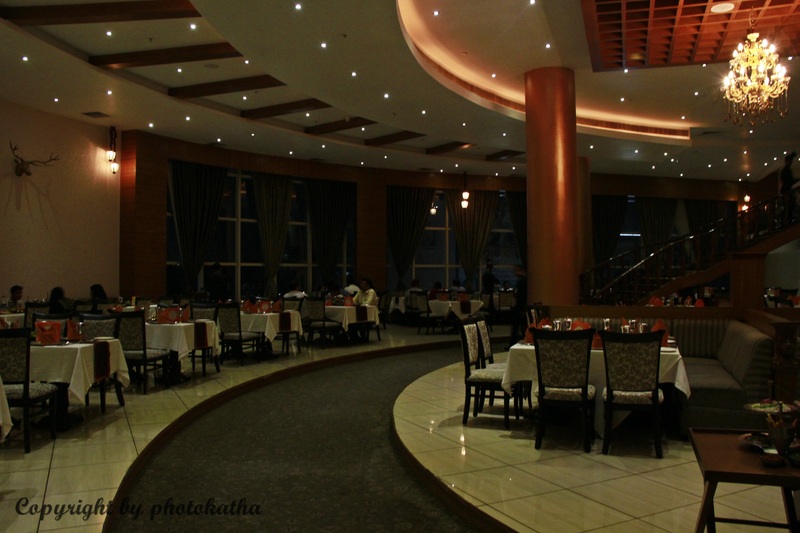 Great cuisine , ambiance and sumptuous food makes it Value for money! 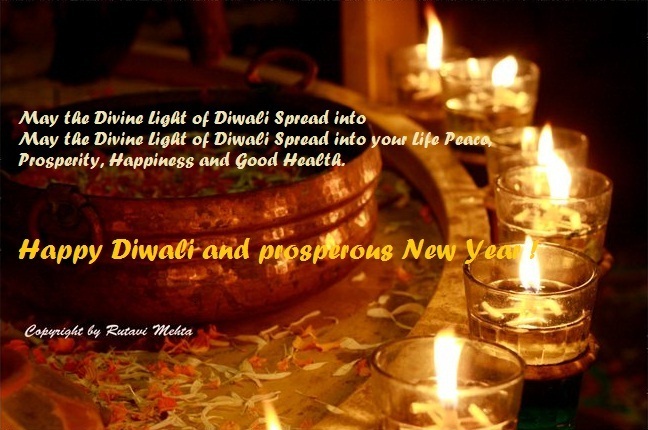 Being away from house for diwali….spending diwali with new people …..this is life. Make every person happy with your smiles. So Smile and Wish Happy Diwali to all around.. Kyunki..Diwali khushiyon ka Tehwar hai! HAPPY DIWALI TO you all who makes me feel connected. Toh is Diwali aap kisko Kush Karenge! Kashmir was my travel plan for July, and yes it was travel where backpacking with two girls gave me good experience of how to travel solo, how to avoid be aware of surroundings, etc. So after a break from travel for months the itch to travel has already happened. The next destination I chose is Pushkar – which is one city in India that everybody is cognizant of and wishes to visit someday. This sacred city of Hindus, is only 10 km from the city of Ajmer in Rajasthan. The city of Pushkar is comfortably settled between hills from tri-directions and the magnificent golden desert form the remaining. Though the climatic variations border the extreme ranges as is the true for any desert the always city is abuzz with activities (Festivals, Fairs, Safaris, pilgrimages etc.) throughout the year. This “Adi Tirtha” finds a revered mention in the epics of Ramayana and Mahabharat. Lord Bramha is supposed to have killed the asura Vajra Nabha with lotus flower. The asura was destroyed by the contact, and petals fell at three places. Brahma dropped a lotus flower on the earth – so say the epics – and Pushkar floated to the surface. One of those places is Pushkar, where a lake was formed. Brahma performed sacrifice on a Kartik Purnima (full moon day in the Hindu Kartik month), sanctifying it. Rows of sacred ghats front a mystically magnetic lake, where hundreds of milky-coloured temples and weather-touched domes sit beneath a shifting, pale grey sky. After booking my flights tickets through Goibibo .com and Indigo directly, I set my journey as solo woman traveler on 22nd Nov to Jaipur. My travel plan is to visit he Pushkar Fair, or Pushkar ka Mela, which is the annual five-day camel and livestock fair, held in the town of Pushkar . It is one of the world’s largest camel fairs, and apart from buying and selling of livestock it has become an important tourist attraction and its highpoints are the “matka phod“, “longest moustache”, and “bridal competition” are the main draws for this fair which attracts thousands of tourists. The festival concludes on the full moon of the Hindu lunar month of Kartika, which falls in October or November. 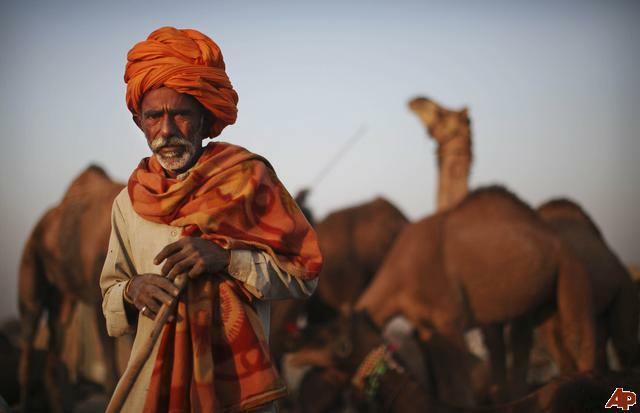 Drawing in 50,000 camels and 200,000 people, the fair is ostensibly a time when Rajasthani farmers gather to buy and sell their camels, cattle and horses – most of the trading, however, is completed in the days leading up to the fair. The next visit after festival is a holy bath in the lake at Pushkar and worship at Brahma temple (one of the very few Brahma temples in the world) is held in very high regards.. Legends claim that, at one time, the shores of the Pushkar Lake were hosting 500 temples and 52 palaces (for numerous kings). Apart of from religious places, Pushkar has also insinuated itself to many for its wonderful shopping centers offering various fabrics, books, Handicraft goods, traditional and fusion music etc. Words of caution though not for me as being vegetarian ; avoid consumption of meat and meat products and alcohol within 5 km of Pushkar. Pushkar Lake is a sacred lake of the Hindus. The Pushkar Lake finds mention on coins as early as the 4th century BC. Pushkar Lake is surrounded by 52 bathing ghats (a series of steps leading to the lake), where pilgrims throng in large numbers to take a sacred bath, especially around Kartik Poornima(October–November) when the Pushkar Fair is held. A dip in the sacred lake is believed to cleanse sins and cure skin diseases. 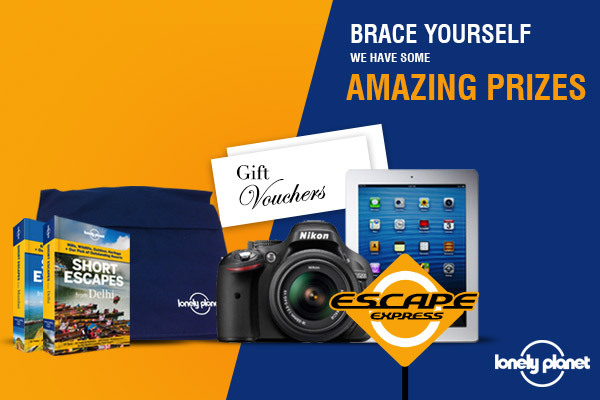 Incase anybody wants to join reading travel plan, please letme know….being solo traveller dun mind company!